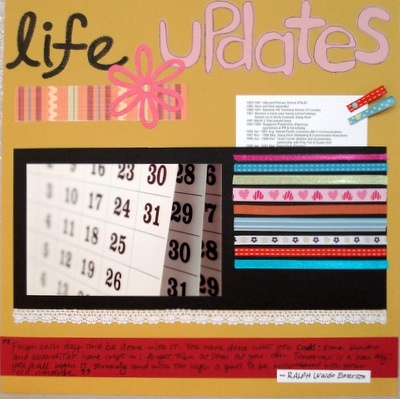 This scrapbooking idea was born out of my desire to keep a record of my jobs, work and major happenings in life. As my birthday is coming up real soon, I was doing a quick mental recap of how far I’ve traveled in life, and realized that though I can remember the overview of my life education and work experiences now, but it doesn’t mean I’ll remember them 20 years down the road. So it’ll be very helpful if I’m to jot down in chronological order, the schools I went to, the jobs I had, some major turning points, etc all in one place. Just a one-liner for each. No big descriptions but little points to shake up my memory in years to come. For me, I’ve printed out a list of my “life updates” and slotted it into the pocket of my layout. If I want to, I can add future updates and slot them into this pocket. Go on, find a quiet place, with a notebook and pen in hand or if you prefer typing it out like I did, open up a new Notepad page on your computer. Then spend the next 15 to 30 minutes scribbling down the major events in your life. Just pointers, no descriptions. Such a useful list for future reference. Have fun and enjoy this week’s idea! Supplies used: Cardstocks – Bazzill Basics; Orange-striped patterned paper – from stash; Flower template – Craftwork “Autocollant”; Ribbons – Celebrate and from stash; Lace ribbon – Daiso Japan; Brads – KCK Craft; Black pen – Zig Memory System “Millennium”; Black marker – Zig Memory System “Dotta-Riffic”.